I've known Dee for awhile now. She is such a talented crafter. I absolutely adore her style and while I love all of her cards I'm always stunned by her watercoloring. Legit, knockout. Even more fabulous than her talent is her sweet disposition. She is always out and about in blog land encouraging others with her genuine comments. Her blog is called Dee's Art Utopia and you won't be sorry you visited. I am someone who is happy and content with all that I have, except for crafty supplies (there always seems to be something missing in my stash, LOL). I love to spend time with my husband, watch movies... eat drink and be merry :) I moved from India to Cleveland, Ohio in 2011 after getting married. I am so glad that I have the opportunity to pursue my passion for arts and crafts which was left out because of work. My style is Clean and Simple, although I love experimenting with different styles :) I enjoy making meaningful, unique and thoughtful cards. While I highly doubt she ever made anything hideous I'm sure we can all sympathize with those first crafty purchases. Please ignore me while I kick that old big lots paper under my desk . . .
Sweet and simple. I love how the bee is abstract. That sweet vellum heart as wings is complete genius!! See what I mean about the watercolor?! I love the flow of the color in the background. I'm a big fan of black with bright colors. An emboss resist is perfect to add some interest. Ahhh. Seriously?! Serously serious?! Those flowers are incredible. White watercolor is no easy task and she nailed it!! First of all . . .how dark does my photobox picture look next to her natural sunlight photos?! Yikes. Okay so I loved her white flowers. I wanted to recreate the flowing background from her second card. The soft vellum from the first card felt like a perfect way to carry the sentiment. I recently purchased my first Clearly Besotted stamps (their flowers. I die) and I thought the lily of the valley was just made for this card recipe. I stamped the flowers onto watercolor paper and heat set in white. I should note I only partially inked the stamped for the flowers in the middle. For the one on the far right I straightened the stamp on my block. I watercolored the image with distress inks including Black Soot, Mustard Seed, Crushed Olive, Peeled Paint, and Forest Moss. Once dry I did draw in a few random with flowers into the background. This really felt like a sympathy card to me. While I loved Dee's bold black sentiments I thought it would overpower my soft image. Instead I opted to heat emboss it on white and wrap it around my panel. Thanks for visiting! I hope you'll go over and visit Dee's blog. She has so much more than just what I showed you here!! Incredible. Both your work and the work of Deepti. Your talents are amazing! Wow!!! This is incredible! Love your take! So nice to get to know Dee through you, Kelly! I love her cards you've featured and your take on them is just beautiful! I will be checking out her blog now. 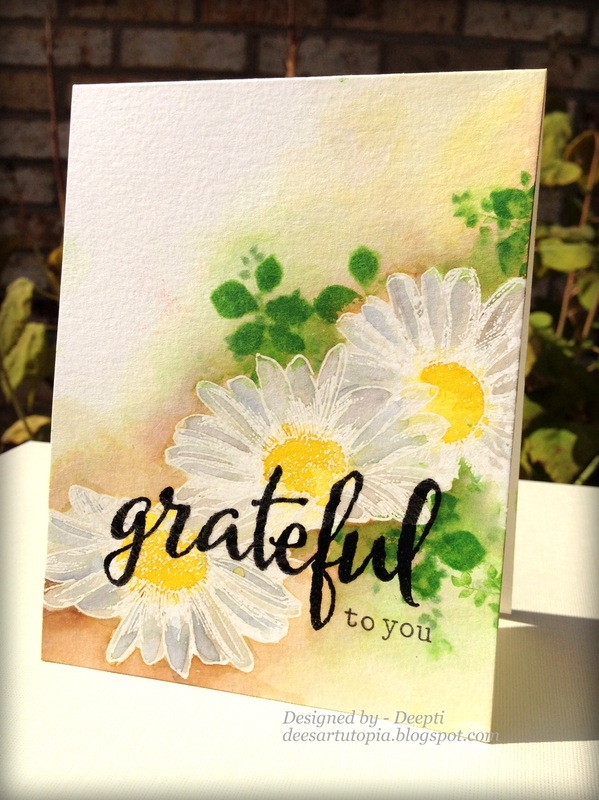 So fun to get to know Deepti a little more and see some of her favourite cards! And your CASE is fabulous, Kelly! Beautiful card! Wow! What a delightful post ! 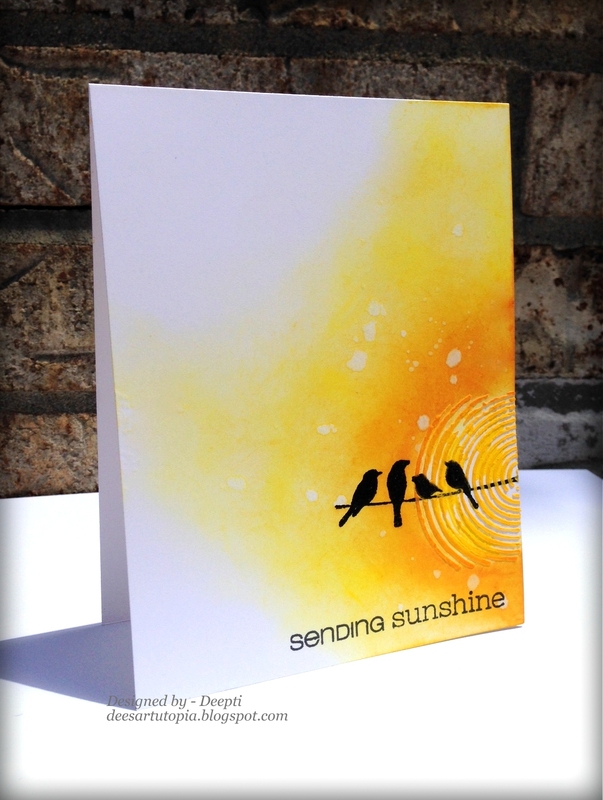 It was great knowing the talented Deepti more and seeing few of her gorgeous cards. And Kelly, your card is so, so beautiful. This is just absolutely STUNNING, Kelly! Just Stunning! Wow! but your card CASE ing her card wooowwwww amazing stunning and I in love with the colors.. BOTH OF YOU ARE SUPER TALENTED lady I ever know..
Are you okay Kelly...I have never seen you again on my blog hope all is ok with you and your little MONSTER (LOL) and hubby. I also LOVE Deepti's work! You did a fabulous job with the CASE! I enjoy studying Dee's artful work! Your lilies and sketchy lines in the background are perfect! Beautiful CASE of Deepti's style, Kelly! I'm a huge fan of CB too, and you have really made those flowers sing, girl! I was so happy to see that you chose my sweet friend for this weeks' feature! You are right about about her too...she is the sweetest and most incredibly talented paper crafter around! I love everything about her! Such a fun feature. Deepti is so incredibly talented. I am a huge fan of Deepti....but Kelly your CASE is incredible! You are just as talented as she is!! Honestly a huge fan too!